Methi Matar Malai is a popular North Indian aromatic and flavorful, creamy curry. 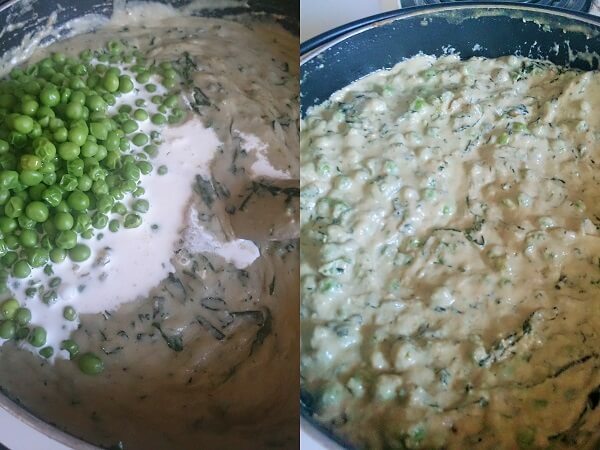 Methi Matar Malai is made with fresh Methi leaves (fenugreek leave), Matar (green peas) and Malai (fresh cream). Methi Matar Malai is a rich creamy and unique combination of Indian spices with green, best accomplishment to roti, naan or paratha and one of the most popular dish in Indian restaurants. Methi Matar Malai is a comforting main course packed with goodness of greens and is very mild sweet and creamy. It is a gorgeous way to eat those greens. This is the dish to convert Methi haters into its ardent fans. 1. 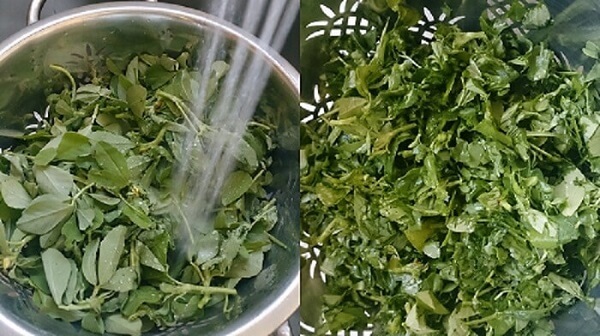 Wash and clean the Methi, then chop it roughly and keep aside. 2. Add all the ingredients to make a smooth paste in a blender. 3. Heat the ghee or oil in a pan or kadai, add prepared paste and fry the paste 4-5 minutes till it raw smell out or starts giving a fragrant aroma, stir it continuously for avoid sticking. 4. Add chopped fenugreek leaves, sauté for 2-3 minutes, then add ½ cup water, mix well and stir it for 4-5 minutes. 5. Add boiled green peas, fresh cream, garam masala, salt, sugar and mix well, stir it and cook it for 5-6 minutes on low flame. 6. Garnish with coriander leaves and serve Methi Matar Malai with naan, paratha or roti. • Sugar and Kasuri Methi is optional in this recipe, adding this gives good flavor to the curry. • If you don’t like bitter taste of Methi, then first you can sauté Methi leaves separately in another pan with little salt, oil and then add into the gravy. 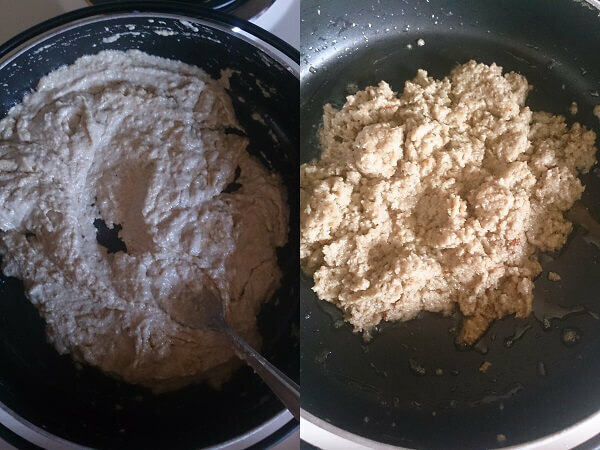 • If you’re using the homemade cream, then whip it till smooth, and then add in to the curry for smooth texture. I used readymade store bought cream so no need to whip. • If you are vegan you can use 1 cup almond milk instead of fresh cream. Methi Matar Malai is a popular North Indian aromatic and flavorful, creamy curry. Methi Matar Malai is made with fresh Methi leaves (fenugreek leave), Matar (green peas) and Malai (fresh cream). Methi Matar Malai is a rich creamy and unique combination of Indian spices with green, best accomplishment to roti, naan or paratha and one of the most popular dish in Indian restaurants. 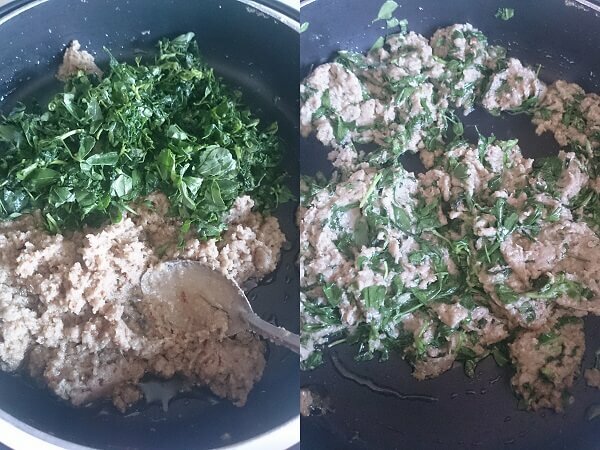 Wash and clean the Methi, then chop it roughly and keep aside. 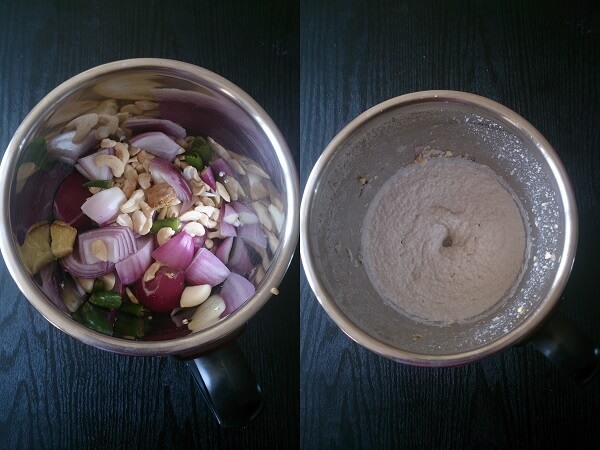 Add all the ingredients to make a smooth paste in a blender. Heat the ghee or oil in a pan or kadai, add prepared paste and fry the paste 4-5 minutes till it raw smell out or starts giving a fragrant aroma, stir it continuously for avoid sticking. Add chopped fenugreek leaves, sauté for 2-3 minutes, then add ½ cup water, mix well and stir it for 4-5 minutes. Add boiled green peas, fresh cream, garam masala, salt, sugar and mix well, stir it and cook it for 5-6 minutes on low flame. Garnish with coriander leaves and serve Methi Matar Malai with naan, paratha or roti.